New study shows temperature in Greenland significantly warmer than present several times in the last 4000 years | Watts Up With That? Kobashi et al 2011 was just published in GRL, and it looks like it will be upsetting the paleoclimate apple cart. The conclusions of Kaufman et al 2009 look to be minimized in comparison to this much more complete study. Questions over the split methodology for the last 60 years of data might be an issue, due to the change in methods of temperature reconstruction before and after the 1950 breakpoint. The amount of recent instrumental data is pretty low, and using it to calibrate the forward model might be a bit dodgy. Figure 1. (top) Reconstructed Greenland snow surface temperatures for the past 4000 years and air temperature over the past 170 years (1840–2010) from three records. The thick blue line and blue band represents the reconstructed Greenland temperature and 1s error, respectively (this study). The reconstruction was made by two different methods before and after 1950. The “gas method” is as described in section 2, and the “forward model” is described by Kobashi et al. . Thick and thin black lines are the inversion‐adjusted reconstructed Summit annual air temperatures and 10‐year moving average temperatures, respectively [Box et al., 2009]. Thin and thick red lines are the inversion adjusted annual and 10‐year moving average AWS temperature records, respectively [Stearns and Weidner, 1991; Shuman et al., 2001; Steffen and Box, 2001; Vaarby‐Laursen, 2010]. (middle) Past 1000 years of Greenland temperature. Thick blue line and band are the same as above. Black and red lines are the Summit [Box et al., 2009] and AWS [Stearns and Weidner, 1991; Shuman et al., 2001; Steffen and Box, 2001; Vaarby‐Laursen, 2010] decadal average temperatures as above. (bottom) Past 4000 years of Greenland temperature. Thick blue line and band are the same as above. Thick green line represents 100‐year moving averages. Black and red lines are the Summit [Box et al., 2009] and AWS [Stearns and Weidner, 1991; Shuman et al., 2001; Steffen and Box, 2001; Vaarby‐Laursen, 2010] decadal average temperature, respectively. Blue and pink rectangles are the periods of 1000–2010 C.E. (Figure 1, middle) and 1840–2010 C.E. (Figure 1, top), respectively. Present temperature is calculated from the inversion adjusted AWS decadal average temperature (2001–2010) as −29.9°C (Figure 1, top). Present temperature and ±2s are illustrated by lines in the plots. Green circles are the current decadal average temperature as above (−29.9°C, 2001–2010). Abstract: Greenland recently incurred record high temperatures and ice loss by melting, adding to concerns that anthropogenic warming is impacting the Greenland ice sheet and in turn accelerating global sea‐level rise. Yet, it remains imprecisely known for Greenland how much warming is caused by increasing atmospheric greenhouse gases versus natural variability. To address this need, we reconstruct Greenland surface snow temperature variability over the past 4000 years at the GISP2 site (near the Summit of the Greenland ice sheet; hereafter referred to as Greenland temperature) with a new method that utilises argon and nitrogen isotopic ratios from occluded air bubbles. The estimated average Greenland snow temperature over the past 4000 years was −30.7°C with a standard deviation of 1.0°C and exhibited a long‐term decrease of roughly 1.5°C, which is consistent with earlier studies. The current decadal average surface temperature (2001–2010) at the GISP2 site is −29.9°C. The record indicates that warmer temperatures were the norm in the earlier part of the past 4000 years, including century‐long intervals nearly 1°C warmer than the present decade (2001– 2010). Therefore, we conclude that the current decadal mean temperature in Greenland has not exceeded the envelope of natural variability over the past 4000 years, a period that seems to include part of the Holocene Thermal Maximum. Notwithstanding this conclusion, climate models project that if anthropogenic greenhouse gas emissions continue, the Greenland temperature would exceed the natural variability of the past 4000 years sometime before the year 2100. Figure 3. Greenland temperature and oxygen isotopes (GISP2, GRIP, and NGRIP) for the past 4000 years. From the top, the Greenland temperatures from this study are presented as a 100‐year running mean (red), with the GRIP borehole temperature inversion (blue dashes) [Dahl‐ Jensen et al., 1998] and the GISP2 elevation change (green) [Vinther et al., 2009]. d18Oice of GISP2 (blue) [Stuiver et al., 1995], NGRIP (green) [Vinther et al., 2006], and GRIP (black) [Vinther et al., 2006] are 100‐year running means with GISP2 additionally smoothed by a 20‐year running mean. 5.3. 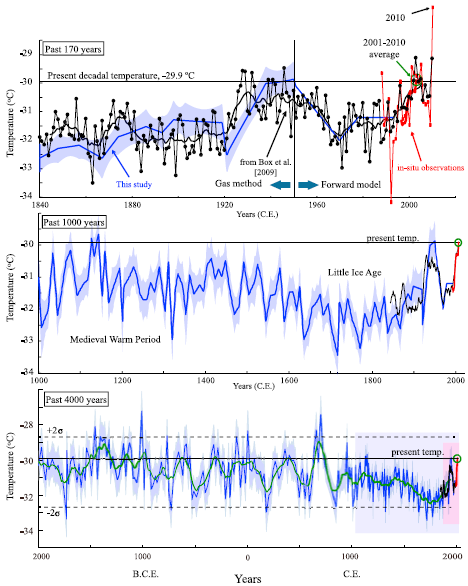 Present Temperature in the Context of the Past 4000 Years  The current decadal surface temperature at Summit (2001–2010) is calculated to be −29.9 ± 0.6°C from the inversion‐ adjusted AWS record (Figure 1), and is illustrated in the 4000 year context (Figure 1). The current decadal average surface temperature at the summit is as warm as in the 1930s–1940s (Figure 1, top), and there was another similarly warm period (−29.7 ± 0.6°C) in the 1140s (Figure 1, middle) (Medieval Warm Period), indicating that the present decade is not outside the envelope of variability of the last 1000 years. Excluding the last millennium, there were72 decades warmer than the present one, in which mean temperatures were 1.0 to 1.5°C warmer, especially in the earlier part of the past 4000 years [Dahl‐Jensen et al., 1998; Wanner et al., 2008]. During two intervals (∼1300 B.P. and ∼3360 B.P.) centennial average temperatures were nearly 1.0°C warmer (−28.9°C, the 97 percentile) than the present decade (Figure 1, bottom). From the above observations, we conclude that the current decadal mean snow temperature in central Greenland has not exceeded the envelope of natural variability of the past 4000 years. This conclusion differs somewhat from the result of a recent reconstruction of Arctic summer air temperature over the past 2000 years, which indicates that a long cooling trend over the last 2000 years ended with a pronounced warming during the twentieth century [Kaufman et al., 2009]. Possible reasons for the differences are numerous, and include at a minimum 1) our record is a mean‐annual temperature, not a summer temperature, and variability is minimal in summer but highest in winter [Box, 2002]; 2) differences between air and snow temperature may be influenced by changes in cloud cover and wind speed, which affect the strength of the near‐surface inversion; and 3) our site is not necessarily representative of the whole Arctic, and may respond in opposite ways to annular mode fluctuations. Citation: Kobashi, T., K. Kawamura, J. P. Severinghaus, J.‐M. Barnola, T. Nakaegawa, B. M. Vinther, S. J. Johnsen, and J. E. Box (2011), High variability of Greenland surface temperature over the past 4000 years estimated from trapped air in an ice core, Geophys. Res. Lett., 38, L21501, doi:10.1029/2011GL049444. ← What Hath Kyoto Wrought? How can they say in the abstract that ‘Greenland recently incurred record high temperatures’ when their own graphs show higher temperatures previously?? An’ will the young people of today believe ya’? Just how many times does it need to be pointed out to you that it doesn’t matter how many times Greenland was warmer in the past because THIS time it’s all due to anthropogenic global warming….? herefore, we conclude that the current decadal mean temperature in Greenland has not exceeded the envelope of natural variability over the past 4000 years, a period that seems to include part of the Holocene Thermal Maximum. Notwithstanding this conclusion, climate models project that if anthropogenic greenhouse gas emissions continue, the Greenland temperature would exceed the natural variability of the past 4000 years sometime before the year 2100. The best sci-fi/horror movies employ the “bear in the woods” method. The “monster” is always just out of sight until the climax of the movie. This was also a great method for keeping Democrats out of the White House from 1968-1992. Shame they had to spoil a good scientific study with the unscientific “Notwithstanding this conclusion, climate models project that if anthropogenic greenhouse gas emissions continue, the Greenland temperature would exceed the natural variability of the past 4000 years sometime before the year 2100.” Or was this just to ensure it got past the peer review mafia? May I offer up this piece of ancedotal evidence in support ot one of the graphs above? One of the lines is annotated Bronze Age Optimum. As a child my Grandma told me of a ‘pot’ my Grandfather had found whilst ploughing one of our fields in 1917…and that it was in the Museum of Ireland. Many years later I went to the museum of Ireland and to my delight found Granda’s pot…an intact Bronze age funerary Urn, with bones and remnants of a dagger. There was someone living on the site of our house…when they were building the Great Pyramid – wow! I got interested and after the the briefest study it was obvious that this long dead chieftan did not live in the same climate I had grown up in. i.e. Summers that barely averaged 18 C, winters that hovered around 6C. Because clearly no culture would have flourished or expanded there in the 19th and 20th Century without coal. The growing season is short and unreliable, with no fuel, burning wood would have been the only way to survive the long chilled winters…hence Ireland’s rapid and disasterous deforestation after the cold set in. I went on to check out some of the 18th C settlement patterns in the west of ireland…and once again I found historical evidence of a climate shift. For a century maybe two the climate permitted subsistence agriculture and a thriving population…then there was the potato famine…by the time I visited there (in the 70s*) there were only desolate moors outlines of stone walls and lost hamlets. Anyone who choses to ignore prima facie evidence from the Danish National Museum of warmer times in Greenland a thousand years ago is more of a denier than the most denialist amongst us. The growth of bronze age culture in Northern Europe is clearly linked to a warm phase…I’m sure the more knowledgable amongst you will know of many more instances of climate change impact on ancient populations…but who was driving round in their SUV causing ‘that’ climate change? Hmnn I wonder. I am of the view that reconstructions of Greenland’s past temperatures very much underestimate the temperature in the Viking settlement period. We know as a fact that coastal regions of Greenland were coloniised by the Vikings and that as the ice today recedes, we are discovering evidence of these settlements. The fact that they are below the presently receding ice confirms that the ice was not there at the time when those settlements took root. In fact in some areas archaelogical digs are hampered by permafrost and digging with ordinary shovel and spade is difficult. Greenland was farmed by the Viking using primative tools ( no mini diggers and no modern day industrialised farm equipment). No non natural fertilizers to promote crop growth etc. Given the then prevailing technology, it is clear that Greenland must have been at least 3deg C and probably between 5 to 7 degC warmer than it is today to support a farm based Viking settlement. It is also extremely likely that Greenland was even warmer in the RWP. It would appear that Northern Europe was warmer in the RWP than in the MWP and that being the case there is no reason to consider that Greenland would in some way have been an exception. One can therefore conclude that the Greenland ice cap in both the MWP and in the RWP must have been significantly less extensive than it is today. Non of the above is quantative but it strong proxy evidence as to ball park temperaturesthat must have then prevailed. It would be interesting if an archaelogical and a farming expert were to provide a summary of their findings in Greenland and what the temperature would have had to have been in order to support a farming community. The whole Cagw house of cards was built on the idea that any recent warming was something out of the ordinary.The more Joe Public can be made aware that fluctuations in climate are common and nothing unusual the sooner the house will collapse. Notwithstanding this conclusion, climate models project that if anthropogenic greenhouse gas emissions continue, the Greenland temperature would exceed the natural variability of the past 4000 years sometime before the year 2100. Does anyone remember the beauty contest in the film Miss Cogeniality where to stand a chance of winning every contestant had to add “and World peace” at the end of their wishes if they were to stand any chance of winning? No hockey stick there. Must be a purely local temperature record? My view is that this temperature record should feature stongly in the next big IPCC 5-yearly report. But I expect the usual suspects with do anything to keep it out. Thank you Antony for this interesting article. I note that one of the authors is Sigfús Johnsen who is well known here in Iceland for his glacier ice core research in Greenland. It is not unlikely that the temperature variation in Iceland has been similar to that in Greenland during the last 4000 years. This map shows the probable extent of glaciers in Iceland 1000 and 2500 years ago. The black outline shows the current extent. The late great John Daly was on to this years ago. GISP2 record is No.1 hockey-stick devastator. C’mon you experts, FIRST explain every uptick in the past and THEN prove the recent one is unprecedented and from 99% caused by “greenhouse gases”. Does Greenland have a geographically consistant climate? This is not really very new, just has always and will be continued to be ignored. I look forward to further reconstruction back to the Holocene optimum. Was no Al Gore present, thus no Al Gore cooling. I can say this with a 93 pct confidence level. Honestly – interesting to understand past climate variations better – allows to seperate science and politics today. I love how any paper that gives evidence that the current warming may be totally natural must throw in a disclaimer acknowledging fealty to the warmist party line. Like John G., I assume that the “notwithstanding” clause was inserted at the revision stage in order to get it past some reviewer. If some silly statement sticks out like a boulder on a flood plain, don’t blame the author – blame peer review. No matter what, we always must throw in a forward worry that is sufficiently ominous as to justify the ongoing ideological war being waged to destroy both our liberty and our prosperity. Is the RAW data available? I don’t care what the conclusions are, I can decide that for myself. I would really like to see an independant reanalysis of the data, preferably by someone with no dog in the fight or even a warmist. Run for your lives! Greenland is melting…no freezing…um…sinking, no, wait, it is breaking off from the Arctic and floating to warmer waters and the edges are melting and the middle is building with unprecedented snow events and we recently found a pre-historic hocky stick uncovered by melting glaciers plus a calendar by Eric Ericson inscribed in stone that says the world will end in 2100! Really!!! What’s with the vertical axis scale? In the first plot, the “current temp” shows at around 28 deg, but in the next two the current temp is just a hair under 30 deg. Is only the decadal average carried into the second and third plots? From about 1600 until 1990 the O18 appears to have a major rise. Is this the Solar signal?? Does this graph finally reveal a simple relationship between Solar Activity, Global temperature, and an Oxygen isotope?? We need to check O18 verses the 10.7cm Flux relationship!!! I will cherry pick  years and say -> YES. If an AGW advocate takes on the raw proxy data, make sure they know which way is up. Michael, I do not blame peer-review. I blame the perversion of peer review at the hands of pseudo-scientific advocates of a climate-change-religion. Peer review works, when it is not bastardised and corrupted into bully-review (Hockey stick, Spencer & Braswell2011), or omitted entirely (BEST). Unprecedented? How fast was the ice melting/freezing year to year, 8000 years ago? What climate science is measuring is the effect of naive statistics. Our historical records are averages of data over many years. Since the historical average does not match today, climate science has mistakenly concluded there must be something different about today. Measure the height of 1000 people and compute an average. Now look at your own height. Does it match the average? No? Then, according to climate science, your height must be changing at an unprecedented rate. How else could it be different than the average? Natural variability? If Hansen extrapolates over 1200km, skeptics have kittens. here you have one site. at the summit in greenland. and you want to draw a conclusion from it? about how warm the entire globe was? Did mann’s brain get loose and colonize in your skulls? In ancient Rome, you were permitted to worship whatever god or gods you wanted, provided that you also worshipped the Emperor. After being involved with WUWT for 4 to 5 years, I find that the scientific method is working wonderfully. Any one of the “Authors” opinions on any scientific analysis is -> mere speculation. Look, we are continuing to test Einstein’s Theory s.
What is really important is the raw data from the “field” studies. We can not let the scientific method from being perverted by “people” claiming that raw data needs to be modified. Who, What, When, Where, and Why on the raw data is critical to future analysis. For instance, Sunspots are one “fact” in the “equation”. So how the Sunspot data was determined is critical, not just the data [which is also critical]. As we unravel the climate enigma, the scientific method will be reinforced. So, as to reason’s why, let the speculation continue. Let us not kill the messenger because he has a “loud mouth”; let us pour over his “raw data” to finally bring understand to the fore. By the way, I feel it is absolutely despicable to pervert scientific research for “immense monetary gain” or “global power” as per Al Gore. Again, it is not the research, it is the “political use of the unverified results”, that is causing the issue. I think the important “take away” is that the significant modern event was the deep cooling event of the LIA. This is clearly the defining “unusual” event. Global cooling was the catastrophic event that should be the concern and alarm of modern climatologists. To label it’s recovery, as AGW, is incompetence bordering on depraved indifference (criminal offense). Yes, it’s you. A record high temperature is the highest RECORDED. It says nothing about temperatures that were not recorded. The melting and breaking off of the Greenland ice sheet is supposed to be one of the potential causes for “catastrophe” from global warming. If that hasn’t happened in the past as much higher temperatures then it seems rather unlikely to happen at our current temperatures. What I find more interesting though is how the temperatures around the Greenland ice sheet in the 40’s were supposed to be warmer than today – and yet GISS’s “models” and infilling show the arctic to be much warmer than the rest of the globe (sans antarctic). Perhaps that is simply due to the differences in temp over land and sea, but I suspect it is that the arctic temperatures vary quite a bit over different areas – which makes their “infilling” method incompetent at best and deceptive at worst. Patrick Michaels book ‘Climate of Extremes’ (chapter 4) discusses the warming of Greenland in the 1950’s. It seems to me that this study indeed confirms increased warming in Greenland during this time period. I enjoyed your account greatly. Thanks. Did I read the graphs right? The numbers on the LEFT were all (-) (negative) Celsius. Isn’t anything NEGATIVE celsius BELOW FREEZING? So, if the temperature is almost ALWAYS below 0 C, for most of the ice sea, whence the change(s)? Greenland has importance in AGW fearmongering beyond its temperature record being cited in support of polar amplification and global warming. This result is another data point confirming the medieval warm period outside of Europe and the coast of greenland. This result correlates with the recent warming, and indicates past periods at this site that were warmer for more extended periods. As a single site, it doesn’t represent all the globe, and the correlation with the Viking coast of greenland may just be a coincidence, but it can’t be assumed to be a coincidence. It is just a data point, but reconstructions of past, supposedly cooler global climates must allow for warmer natural variation at the summit of greenland for extended periods without catastrophic melting and sea level rise, and for a medieval warm period that is also warm at the greenland summit (more distant from the gulf stream). We’ll have to see how difficult these new constraints are for the models. Less hilarious than claiming to know the whole NH record from one strip bark bristlecone. When Greenland is claimed to melt unprecedentedly, it is a proxy for the whole burning planet. If Greenland record shows it survived warmer past and experienced natural and much higher temperature swings, it suddenly “does not matter”. You son of a Tiljander swap. “Greenland recently incurred record high temperatures (RECORD HIGH?) and ice loss (REALLY, WITH ICE MASS WAS INCREASING?) by melting, adding to concerns that anthropogenic warming (BIG ASSUMPTION) is impacting the Greenland ice sheet and in turn accelerating global sea‐level rise (SEA LEVEL IS DECLINING?). Forgot to add /sarc. I just quoted usual warmists pseudoarguments. The “Wolf cry” of wannabe despots who wish to exercise control over everything on planet Earth, including Nature. Arrogance and conceit on display. ‘The Viking world’ goes into considerable detail of the number and type of farms in Greenland during the period; It is a first class read. “… I blame the perversion of peer review at the hands of pseudo-scientific advocates of a climate-change-religion. Yes, peer review can work, but climate science is hardly the only field in which it quite often takes the shape of buddy or bully review. > So, if the temperature is almost ALWAYS below 0 C, for most of the ice sea, whence the change(s)? The only references to melting are in the comments, and then refer either to coastal regions or snark. The ice core was drilled in the high terrain inland. It’s colder there. Now, you might have something if you compared air temp with the surface altitude over time…. In all non-hockey stick studies, global temperatures cannot be measured based on single sites. Even if Greenland was warmer, the southern hemisphere (or somewhere else with no accurate data) must have been colder so the global mean was still lower than present. While its pleasing that studies like this are getting though the Hockey Team blockade, I think its worth pointing out that just because it confirms something that a lot of people here believe does not mean that its good science. 2. It contains methodology that has yet to demonstrate a close empirical relationship with temperature. 6. We should all beware of seeing in the graphs or data patterns which are barely distinguishable from noise. Red noise, with similar properties can easily do what this graph can do. 7. I’ll bet good money that the error bars applied are much too small. 8. I’d wait to see what replication would throw up as issues. Why does it end at 2000? Is it too much work to include the most recent data? The thing is that “warmists” will tend to dismiss the RWP, MWP and LIA as “local”. Whereas the CWP is “global”. were by far the hottest in the whole Holocene, this would not demonstrate human causation. This is because there have been previous interglacials much warmer than the present one and entirely caused by natural factors. On average, the last five interglacials were two degrees centigrade warmer than our Present Warm Period. Snow was green back then. Why argue with stupidity. Look at the “pre transition ringing” we are now in! There is only one way any such transition can now go and it ain’t up! >>How can they say in the abstract that ‘Greenland recently incurred record high temperatures’ >>when their own graphs show higher temperatures previously?? It is important in any paper to first justify the grant money with whatever nonsense is necessary, before getting on with the facts. I’ve read with great interest many posts here at WUWT calling into question the reliability of temperature proxies to do paleo-climate reconstructions. Specifically asking how reliable tree ring and ice core data are in that regard. Is there any particular reason why this reconstruction is any different? I find the archeological evidence of past farmsteads much more persuasive. How does dating with nitrogen and argon isotopes work? @ charles nelson (3:09 am). I’m aware that they are not applying it to the whole globe. I’m suggesting that people remain diligent in their skepticism of all claims ESPECIALLY claims that confirm what you believe. 2. try to find the errors, assumptions, limitations, uncertainties. The same goes for documentary records, anecdotes, imprecise proxies. BCP are to be avoided. Didnt you read the NAS? In general I’d be highly skeptical of any tree ring from a species that was prone to mechanical issues: like stripbark.. Yamal as well. Learn something from the mistakes. Yup.. you up for Lunch when you get here for AGU? As a non-scientist, I venture to suggest that all paleoclimate evidence is inescapably imprecise. Absolutely, but unfortunately the same applies to almost all the data in the climate science field. There is a general failure to admit uncertainties. Proxy evidence is at best a ball park figure for order of magnitude and nothing more. It could be out by many many degress or in the case of CO2 by 100s of ppms. The bottom line is that we lack quality data such that no one knows whether it is today warmer than it was in the late 1800s or 1930s (I think that probably it is warmer today but the quality of data is such that one cannot be 100 percent certain of that) and we have no real idea as to the temperature profiles going back say the past 5000 years (there is reason to believe that it was warmer in the MWP and RWP but by how much and over what periods no one knows). Ditto the CO2 record. There is a lot of evidence to sugggest that the IPCC’s pre-industrlal figure is wrong. Ice core data cannot really be relied upon since we know insufficient about how CO2 behaves on entrapment and long term in ice. The only data that stands scientific scrutiny is the satellite data and even that has issues. I cannot see how any scientist could be sufficiently confident in the data to draw any firm conclussions. If realistic error/uncertainty bars were to accompany all data, it would soon be apparent that there is too much uncetainty to draw any firm conclussion. . The early Viking sailors used a 12,000 ft. high Greenland mountain known as Blaserk (Black Shirt) as a navigational landmark. After some centuries the mountain was renamed Hvitserk (White Shirt) and is now known by the Danish name of Gunnbjorn. This photo shows the white “shirt” of snow covering the mountain up to its black crown. Presumably should Greenland climate once again approach the MWP climate, and for a sufficiently long time, the mountain will once again wear a black shirt. Gunnbjørn is not a Danish name, as I originally wrote, rather it is the name of Nowegian Gunnbjørn Ulfsson, the first Viking credited with the discovery of North America (Greenland). This 1880 translation of the saga of Eric the Red from Icelandic Saga Database gives the name of the mountain as Blaserkr (Blue Shirt). Blue shirt would more likely refer to the color of blue glacial ice after the snow melt, so not necessarily black. Relative to the instrumental record – so they reconstructed temps further back to see if it was outside natural variability over a longer period. Is it a surprise that Greenland may have been warmer in the past? That’s not at odds with the mainstream view. Don’t let the unlearned tell you that climatology is dull. — Greenland does not get a large fraction of solar radiation. Greenland is more likely to see wider variations in temperatures than some warmer parts of the planet yet has less of an impact on global averages. — Greenland being “green” might be in contrast to European northern lands being much less so at the time. — The new dating method using “argon and nitrogen isotopic ratios from occluded air bubbles” is a bit more likely to have kinks that need to be ironed out (judging strictly from the newness perspective). — As more people come to replicate the experiment, we will gain confidence (or lose it) in this particular study. — If there are natural cycles (in Greenland) and they end up being due for another heat wave in the near future as they presumably had a few thousand years back, the unchecked CO2 fossil fuel releases won’t be seen as too good of a thing. 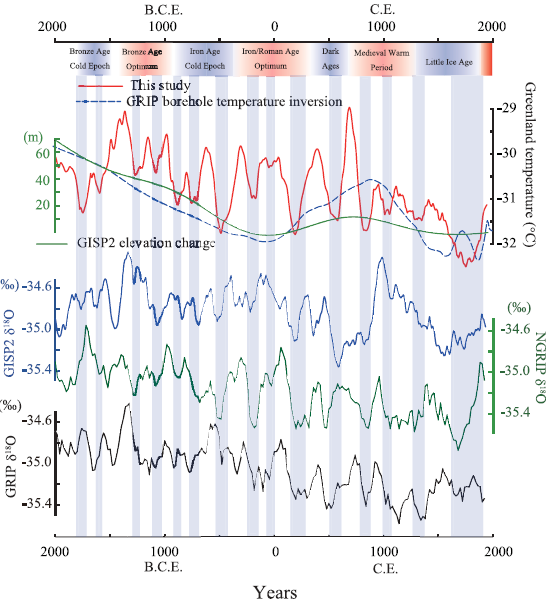 The ‘d18O’ ice of GISP2, GRIP, and NGRIP show slightly decreasing trends .. over the past 4000 years (Figure 3). Well, what would be fine, if both, the cause of the high variability and the cause of the slightly decreasing temperature, would be explained. As suggested from R. Ehrlich, resonant photon diffusion waves taking the time of about 190 ky and saw tooth modes, the decreasing trend is still the relaxing part of the saw tooth oscillation in the sun. This can easy be shown, using the 190 ky time in a simulation of 1000 kyear. I think it is not a good idea to argue at the same time on a 4000 year trend AND on the variability of the global climate. Figure 3. Greenland temperature and oxygen isotopes (GISP2, GRIP, and NGRIP) for the past 4000 years. From the top, the Greenland temperatures from this study are presented as a 100‐year running mean .. The nature of the climate periods between 1800 years and some month can be argued from the solar tide connected to synodic function of the known planets.